I’m a lady fighting plastic, but on the day of writing this column, I’ve lost the war. Currently, I’m finishing off a Cameo Cream from a plastic packet (bought by my husband may I add) to give me the required end-of-day sugar boost to keep writing (I’m a writer by trade). The other day I bought a Kinder Surprise for my daughter at the supermarket to stop her moaning. Of all the evil single-use plastics out there, this has to be top of the pops – a tiny plastic toy, encased in a plastic egg, covered with chocolate! Plus, what an amazing parenting moment. I keep forgetting to say no to straws when ordering smoothies. I can’t give up pasta (which comes in plastic). I can’t give up berries (which come in plastic). The list goes on. That’s right, I’m the first to put up my hand and admit changing habits is hard, especially when plastic is ubiquitous. I mean, for Pete’s sake, it’s even in our tea bags! However, it’s also fun. Really. Nothing beats the heroic ‘I’m-beating-the-stupid-corporations-and-their-unethical-plastic-packaging’ feeling swanning past the nappy aisle or the rice aisle and not buying the stuff. About nine months ago, our family began a journey of reducing single use waste, basically borne from our horror at our overflowing rubbish bin and what it was doing to the planet. We’ve come a long way, and as you can see, still have a way to go, but I’m keen to share my tips, advice and, conversely, my failures with you. One of the best ways you can cut waste is to take some inspiration from how your grandmother lived her life – cook and bake from scratch when you can. I choose fresh seasonal fruit and vegetables, which are better for my family and better yet, my money goes directly to growers in Hawke’s Bay. I shop for fruit and vege at the Hastings Farmers Market and local growers in Meeanee – using my cloth bag of course! As I’m married to a vegetarian, we mainly make and eat simple vegetarian meals like vegetarian lasagne (lasagne is one of the only foods at the supermarket that is packaged in just cardboard! ), stir fry, vegetarian pizza, omelettes and falafel wraps. I buy my dry staples from bulk food stores, either Bin Inn in Taradale or Hastings or Chantal’s in Napier, and this includes flour, oats, nuts, seeds, and popcorn. I put the dry ingredients in cloth bags or jars. To be honest, I’m still working out an efficient system for this kind of shopping, but like everything, it requires planning. Pro tip: toddlers and bulk food stores are an unhappy combination. The last time I took my one year old in to Bin Inn, he was determined to use the steel scoop to fling popcorn on the floor, and when I wrenched the scoop from his hands, I might as well have cut off his finger for the wailing that ensued. When I have time, I bake bread. I have the easiest bread recipe in the world. Go to one_lady_fighting_plastic on Instagram and you’ll find it in my stories. Freshly baked bread has to be one of the best smells in the universe. My latest culinary waste-free discovery is fermentation. This is truly exciting, because it’s so delicious, easy, uses vege and fruit scraps, is good for your gut and cheap – so many wins. 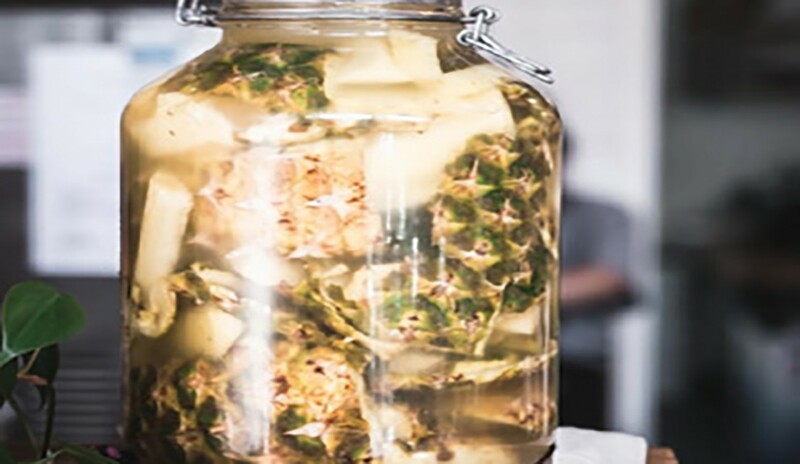 I’ll end this with a recipe for Tepache – the chilli flakes are the hero ingredient! Drink when you think it’s ready! Nice with ice!